I was contacted a few months ago by Pladask Elektrisk and they wanted to let me know about their new venture. Pladask Elektrisk is a new effects company out of Bergen, Norway and a company that focuses on ‘sonic experimentation’. Their first pedal is the Gjengangar which translates to ‘recurring’ or ‘ghost’. This is a ‘gate-delay’. Okay, you have my attention now. Gate-delay you say? Of course I was interested to hear more. The guys there sent me the Gjengangar for a give away, and I had a chance to play it today. This is one of the coolest delays I’ve ever played. Now, I’ve played a lot of delays, but the gate is the coolest aspect of this delay. There are the standard controls you’d expect from a delay – feedback, mix and delay, but additionally, there is threshold, release, tails, tone and soft. Most of these are 3 position switches for flavor (ie: brightness on the repeats, etc), But the action is at the threshold. So the concept of this delay is that it reacts to your playing. Crank the mix and feedback and play softly. You do hear little to no delay. Hit the chord hard and bam.. big time trails. It’s awesome. I was playing this for hours today. So much good from this.. and I know I’m just cracking the potential of this pedal. Other great feature, the softtouch switch for turning pedal on/off can also be used for momentary feedback. Mind blown. Oh.. and the unit looks super cool. Punched letter controls. I love the look. 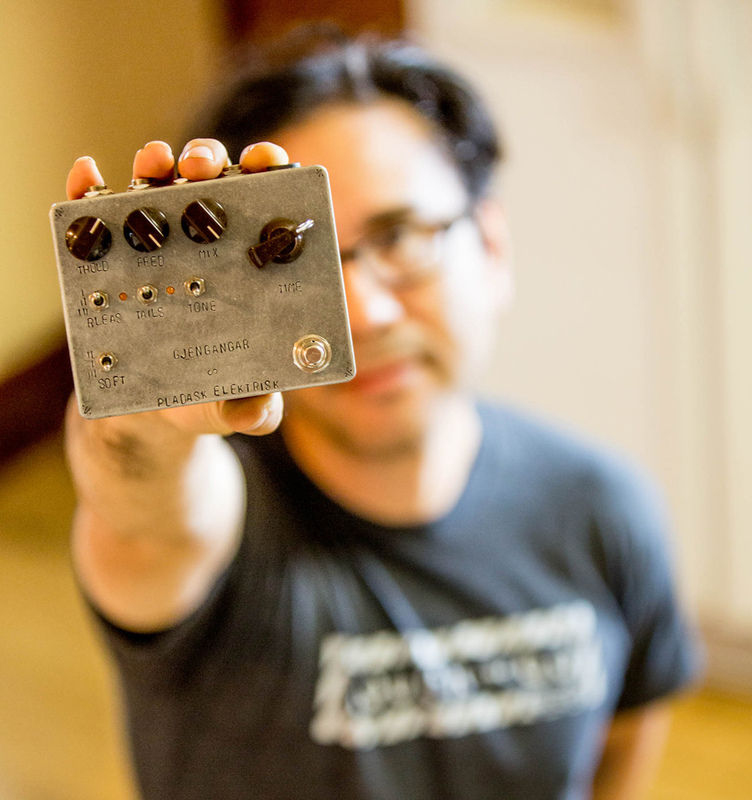 So far… thumbs WAY up on this pedal. Like I mentioned, Pladask Elektrisk is a new company, so be sure to check out their website, subscribe to them on YouTube and give ’em a like on Facebook! They were super kind and willing to offer up this pedal for a give away. And man.. I want this for myself! So let’s talk about the give away! I’m going to pick a random entry on November 5th. I will email that random entry asking for the answer to the question listed below. You will have 24 hours to respond with the answer. If the 24 hours passes and I don’t hear from that finalist, I will select a new random entry and repeat the process until I receive confirmation from the winner. This is open to everyone. Yes, that means international! Also, one entry per person. Please read that last sentence again… “one” “entry” “per” “person”. The submission form will be open until November 5th (Thur) 2PM MST. VFE Pale Horse Winner – Congratulations Mike Kabatt! Please make sure if you request an answer to"captcha" that a "captcha" shows up in post! Maybe refresh your browser. It does display…. getting a ton of entries.